New article by Felix Anderl and Philip Wallmeier Modi der Kritik des Internationalen Regierens. Ein Plädoyer für immanente Kritik published in Zeitschrift für Internationale Beziehungen. New article by Lisa Bogerts: „,Deutschland sprüht vor Ideen‘ – Street Art als ikonographische Herrschaftspraxis“ published in Leviathan (Nomos). The new article „Unlocking the agency of the governed: contestation and norm dynamics" by Lisbeth Zimmermann, Nicole Deitelhoff and Max Lesch was published in the special issue of Third World Thematics. Felix Anderl has published an opinion article on the World Bank Group's oil and gas policy in the Jakarta Post. A special issue was recently published in Leviathan (Nomos) on changes of protest (“Protest in Bewegung. Zum Wandel von Bedingungen, Formen und Effekten politischen Protests“). Contributors include Sigrid Baringhorst, Swen Hutter, Christian Lahusen, Oliver Nachtwey, Sieglinde Rosenberger and Sabrina Zajak. New Article by Lisa Bogerts: “Mind the Trap. Visual Literacy, Street Art, and Visual Resistance” published in Street Art and Urban Creativity (SAUC). Rowman & Littlefield International recently published Priska Daphi’s book „Becoming a Movement. Identity, Narrative and Memory in the European Global Justice Movement” (open access). It forms part of the series “Radical Subjects in International Politics”. Lisbeth Zimmermann's monograph "Global Norms with a Local Face. Rule-of-law Promotion and Norm Translation" will be published by Cambridge University Press in August. It is part of the series "Cambridge Studies in International Relations". The new article "Beyond diffusion: cyclical translation of international rule-of-law commission models in Guatemala" by Lisbeth Zimmermann was published in the Journal of International Relations and Development. For her dissertation Antonia Witt received the Christiane-Rajewsky-Prize of the German Association for Peace and Conflict Studies. Lisa Bogerts published a new article on Art as Resistance in PERIPHERIE. From 26-28 January 2017 Antonia Witt, Augustin Loada and Ulf Engel are organising a workshop on "African peacemaking seen from below". The workshop takes place at the "Centre pour la gouvernance démocratique" (CGD) in Ouagadougou, Burkina Faso and is funded under the Point Sud programme of the DFG. Lisbeth Zimmermann published the article ""Inter-National" Habermas: Contestation and Understanding under Conditions of Diversity" as part of a symposium on contestation and international relations in Polity. Lisbeth Zimmermann and Katharina Glaab jointly organize a European Workshop in International Studies titled "The Politicization of Expertise: Contentious knowledge politics in international organizations" (7-10 June 2017, Cardiff University). Click here for more information. Priska Daphi recently published the article "Imagine the streets": The spatial dimension of protests' transformative effects and its role in building movement identity". The new Textbook by Nicole Deitelhoff and Michael Zürn "Lehrbuch der Internationalen Beziehungen. Per Anhalter durch die IB-Galaxis" was recently published by C.H.Beck. Antonia Witt, Felix Anderl, Stefan Kroll, Philip Wallmeier edit a blog series on global international relations. See here for the first article, Clues, Careers, and Curricula – How to Do Global International Relations? In the first week of May the Department of International Relations and Theories of Global Orders hosts, in cooperation with the Asienhaus, Urgewalt and the Institut für Protest und Bewegungsforschung, three events that are linked to the meeting of the Asian Development Bank (ADB) that takes place in Frankurt this year. On Tuesday, the 3rd of May at 5pm, there will be a lecture by Aram Ziai (Kassel, Germany) on "Can the subaltern file claims? The World Bank Inspection Panel from a postcolonial perspective". The same evening at 7pm, Titi Soentoro (AKSI, Indonesia), Rayyan Hassan (NGO Forum on ADB, Philippines) and Chris Lang (REDDMonitor/Asienhaus) will present the impact of ADB-projects in the contexts of gender, rights and environment. On Friday, the 6th of May there will be a workshop day by the working group "Bewegungen und Institutionen" of the IPB. The topic will be the interaction of social movements with international organizations. For this workshop we ask you to register here: anderl@soz.uni-frankurt.de. You can download the poster here. Lisbeth Zimmermann published together with Jonas Wolff (PRIF) the article "Between Banyans and battle scenes: Liberal norms, contestation, and the limits of critique." in the current Review of International Studies. This semester Thorsten Thiel is Interim Professor for Political Theory and History of Political Thought at Trier University. Therefore there will be no office hours and examinations in Frankfurt. Thorsten Thiel can still be reached via Mail: thorsten.thiel@normativeorders.net /thiel@hsfk.de. Felix Anderl has published a review of the textbook "Process Tracing: From Metaphor to Analytic Tool" by Andrew Bennett und Jeffrey T. Checkel. Since January 2015 Nicole Deitelhoff and Christopher Daase are the executive editors of the journal "Zeitschrift für Internationale Beziehungen" (ZIB). ZIB is the leading journal on International Relations in German. It is published on behalf of the section "International Politics" of the German Association for Political Science (DVPW). Manuscripts in German language can be submitted for the double-blind review process at any time to the editorial office (Lisa Bogerts,zib@soz.uni-frankfurt.de). Further information can be found here. (20.01.2015) Ben Kamis and Thorsten Thiel published an article with the title "The Original Battle Trolls: How States Represent the Internet as a Violent Place" in the series PRIF Working Paper. In this article they analyze the rise and the connotations of the metaphor of the "Cyber War". The authors examine how souvereign statehood is constructed and established in the internet - a space long considered averse to statehood. (08.12.2014) An joint article by Nicole Deitelhoff and Thorsten Thiel with the title "Keine Widerrede? Opposition und Deliberation in der überstaatlichen Politik" has been recently published in the volume "Deliberative Demokratie in der Diskussion" , edited by Claudia Landwehr and Rainer Schmalz-Bruns. The article evolved from a session of the conference of the section Political Theory of the DVPW in 2013 where it was discussed how deliberative democrcay theory is able to reflect current times. (25.11.2014) The first volume of the new publication series "Internationale Politische Theorie" (Nomos) edited by Thorsten Thiel and Christian Volk has been published. This volume, for which Friederike Kuntz and Christian Volk are responsible, deals with the concept of sovereignty in transnational constellations. it also contains an article by Thorsten Thiel about "Internet and Sovereignty" ("Internet und Souveränität"). The publishers look forward to any suggestions for further volumes and monographs. (18.11.2014) Thorsten Thiel wrote with Andreas Busen (Hamburg) a literature review on the deveploments in republican theory for the new edition of the Zeitschrift für Politikwissenschaft (Vol. 24, Heft 1-2). The article discusses Philip Petit's recent work "On the People's Terms" and "Just Freedom" in light of other republican approaches and critiques. The article is accessible through the web-page of the journal. (11.08.2014) The International Dissidence research group and the Cluster of Excellence “Normative Orders” held a film pre-preview and a discussion on “Varieties of Anarchism: Anarchist Projects and the Struggles that Define them” on 7 August 2014.After the film pre-screening Prof. Lucien van der Walt (Rhodes University, South Africa) held a lecture on the historical classification of anarchist movements and their differences. The audience discussed the topic with the film director Marcel Seehuber and Prof. Lucien van der Walt. (04.08.2014) The International Dissidence research group and the Cluster of Excellence “Normative Orders” invite you to a film pre-preview and a discussion on “Varieties of Anarchism: Anarchist Projects and the Struggles that Define them” on 7 August 2014 at 6:15 pm.Starting with a film pre-screening and a lecture by Prof. Lucien van der Walt (Rhodes University, South Africa), we will inquire into the differences and convergences among historical and modern anarchic projects in the subsequent discussion.The film pre-screening and discussion will take place in the Normative Orders Building, Campus Westend, Room EG.01 (Corner of Lübecker Str. & Hansaallee). (04.08.2014) The International Dissidence research group organizes three panels on rule and resistance beyond the nation-state at the upcoming Fourth Global International Studies Conference sponsored by the World International Studies Committee (WISC) in Frankfurt, 6 – 9 August 2014.The three interrelated panels are organized by Ben Kamis, Jannik Pfister as well as Janusz Biene, Daniel Kaiser and Holger Marcks and cover the following topics: “Depoliticized Rule in Transnationalizing Governance” (Chair: Ben Kamis), “Rule by Definition: How International Authority is Encoded into Normative Language and Concepts” (Chair: Jannik Pfister) and “Transnational Dimensions of Violent Dissidence” (Chair: Christopher Daase).Participants and discussants include: Christian Volk (University of Trier), Regina Hack (Goethe-University Frankfurt), Isabel Rocha de Siquiera (King’s College London), Sebastian Schindler (Goethe-University Frankfurt), Juha Antero Vuori (University of Turku), Claudia Baumgart-Ochse (PRIF, Frankfurt), Benjamin Wilhelm (University of Erfurt), Svenja Gertheiss und Carmen Wunderlich (PRIF, Frankfurt), Priska Daphi (Goethe-University Frankfurt), Lucien van der Walt (Rhodes University), Carolin Goerzig (Virginia Commonwealth University) und Jérôme Drevon (Durham University).Lisbeth Zimmermann and Nicole Deitelhoff are also going to present a paper on resistance against the Responsibility to Protect at the panel “Norm anti-preneurs and the Laws of War” (Chair: Alan Brian Bloomfield) and Christopher Daase presents a paper on the historical perspectives of Just War Theory at the panel “Justice and Just War Theory” (Chair: Simone Wisotzki).For more information on the conference see www.wisc2014.uni-frankfurt.de. (26.06.14) Lisbeth Zimmermann has published an article on norm diffusion in post-conflict states in the journal Internaioal Studies Perspective. (04.06.14) Thorsten Thiel has published a comment on the latest European elections in the internet magazine Eutopia. Ideas for Europe. "In elections we trust. The state of European democracy after the European elections" argues that the European elections brought about a significant push of politicisation and that the discussion on its results should not solely focus on the polarization by eurosceptics. (04.06.14) Thorsten Thiel contributed an article to the recently published Peace Report 2014 (so far only in German) which is issued by five German institutes of peace and conflict reseach. The artcile "It was the best of times, it was the worst of times: Internet und Demokratie nach den Snowden-Leak" deals with the reactions by internet-policy on the Snowden-leaks. The research on international rule and transnational dissent that unites many projects overseen by Profs. Daase and Deitelhoff has found a new outlet with the recently released Working Paper Series on international dissidence. The series will introduce various aspects of the research we are conducting and present preliminary results for broader academic debate. Profs. Daase and Deitelhoff open the series with a paper on the reconstruction of global rule through dissident. Stay tuned for further editions! In PRIF Working Paper No. 18 "Things We Lost in the Fire" Nicole Deitelhoff and Lisbeth Zimmermann analyze the contestation of norms and its effects. Profs. Deitelhoff and Daase present the new lecture series, "Beyond Anarchy: Rule and Authority in the International System", beginning on 16.10 on behalf of the Cluster of Excellence: the Formation of Normative Orders. Prof. Robert Keohane of Princeton University will open the series with a lecture on "New Modes of Pluralist Global Governance" on 16.10 at 6:15 p.m. in HZ 3 on the Westend Campus. Prof. Nikita Dhawan, a member of the Cluster, will present the following lecture on the topic of "The Politics of the Governed: Alter-Globalization and Subalternity" at 6:15 p.m. in HZ 1 on 23.10. The Peace Reasearch Institute Frankfurt (PRIF) and the Global Public Policy Institute Berlin (GPPi) jointly organize a project workshop on "Global Norm Evolution and the Responsibility to Protect". Nicole Deitelhoff will discuss with Christopher Daase, Philipp Rotmann and Gerrit Kurtz the question "(How) do contestation and evolution help us deal with non-linearity and openendedness?". The workshop will be held from 26 to 27 September 2013 in the "Normative Orders" Building. Nicole Deitelhoff/Lisbeth Zimmermann (2013): Aus dem Herzen der Finsternis. Kritisches Lesen und wirkliches Zuhören der konstruktivistischen Normenforschung. Eine Replik auf Stephan Engelkamp, Katharina Glaab und Judith Renner, in: Zeitschrift für Internationale Beziehungen, 20:1, 61-74. Lisbeth Zimmermann/Andreas von Staden/Angela Marciniak/ Linda Wallbott/ Friedrich Arndt (2013): Muss Ordnung sein? Zum Umgang mit Konflikten zwischen normativen Ordnungen, in: Zeitschrift für Internationale Beziehungen, 20:1, 35-60. Sven Reichardt from the University of Constance will be giving a guest lecture on "Mediale und (trans-)staatliche Reaktionen auf den Terrorismus am Ende des 19. Jahrhunderts" to open the lecture series: „Protest - Widerstand - Aufstand. Streit um politische Ordnungen“. The lecture will take place at 18:00 on 17 June 2013 in room EG 01 in the Normative Orders Building. The lecture will be given in German. 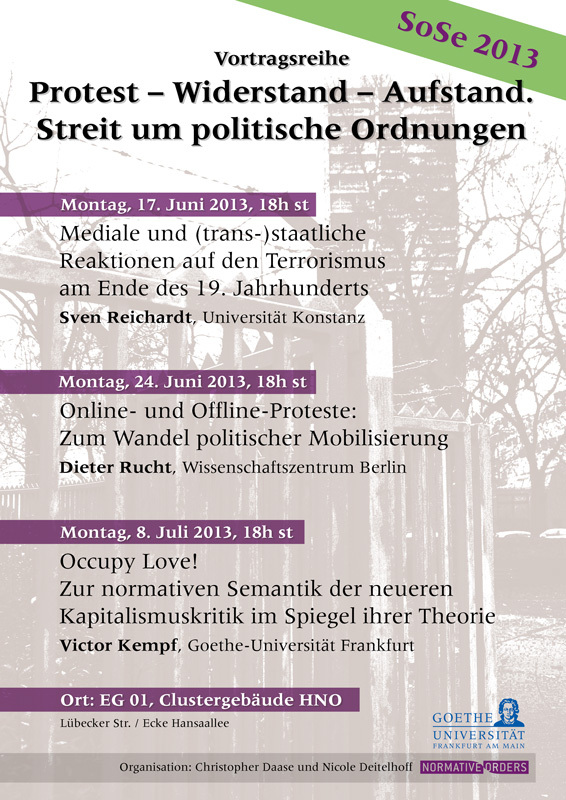 Nicole Deitelhoff will be giving a lecture at the grand opening of the Institute for Social Movement and Protest Research at the WZB in Berlin on 20 June 2013. (30/04/12) This summer term, the Chairs of Professor Deitelhoff and Professor Daase organize again a series of lectures on "Protest - Resistance - Uprising. Dispute over political orders". Sven Reichardt (17/06/13), Dieter Rucht (24/06/13) and Victor Kempf (08/07/13) will present and discuss their work. The lectures start at 6 pm in room 01 in the "Normative Orders" building. Priska Daphi recently published the article “Imagine the streets”: The spatial dimension of protests' transformative effects and its role in building movement identity“ [d1] in Political Geography.